Designed by Christine DeGennaro and made of vegan faux-leather, Sydney Love reversible tote bags boast a unique combination of European styling and American practicality. Rich colors and exposed stitching "inside and out" are a nod to Christine's appreciation for Italian design, while reinforced straps add durability and comfort for carrying everything from your laptop and wallet to workout gear and other essentials. With its reversible design, this carry-all is two bags in one. No need to pack a second shoulder bag when you can flip your Sydney Love inside out to change its look as often as you change your outfit. We feel that individuality is expressed in one's choice of accessories and we strive to create unique and distinctive products that demonstrate that individuality. Thanks for joining us here: we look forward to hearing your thoughts, and we're happy to answer any questions. Great design, good value for price. @Guest Thanks, we hope you love carrying your new Sydney Love bag! Love the video instruction for the handbag by the designer. And the handbag colors choices are great! @SiSi Thanks, SiSi. We had so much fun filming the video. We just love the colors. And the bags are so versatile. It's a big decision, which way to wear your bag each day. @Christine I'd call it a fun rather than a "big" decision on how to wear the bag each day. @Guest You are right that is what we call FUN. that should be the biggest decision we have for the day! Your line keeps getting better and better! I love this tote, just need to decide on a which color!! @Diane Hi Diane. We can't decide. Our suggestion is to buy all 3!! I absolutely love it! The size is big enough for me to carry EVERYTHING with me! The colors are amazing and so fun! 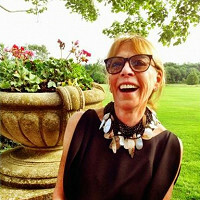 @JOAN Hi Joan. Yes, you're right. It's a carry-all with a fashion flair. The colors give you so many options. 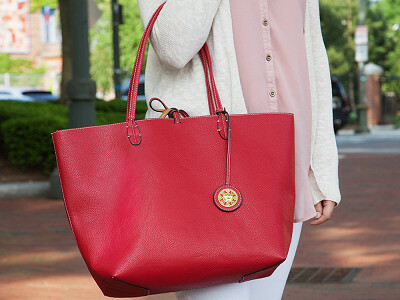 The reversible feature makes the tote wearable all day long, all year long. Aloha, I live in Maui, HI and wanted to order all three combo colors. However, the shipping is $73.00!!! Why so much? Where is it coming from? I know this may seem expensive and unfortunately Hawaii will not qualify for our free shipping discount as they can't be shipped via ground. Do you have a friend you can send them to on the mainland? Perhaps they can hold onto them for you. @Amy Thanks for your quick reply! I do have a cousin in Sacramento, CA. Of course, I would have to buy HER a bag if she handles my package. So, what would the difference be? She would have to mail it to me, and I prefer USPS flat rate. Today we are offering free shipping for ground service so it wouldn't cost anything to ship to her in Sacramento. You would need to check with the post office to see how much it costs for her to ship to you from CA, but it may end up costing you less. How would I care for these bags if I had a stain on them? You can always find information like this in our details portion which you can find when you click into the box that says "buy". We recommend wiping with a damp, soft cloth. 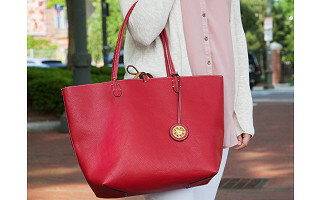 Love this tote.....the reversible colors are just fabulous! I may have to get one in black. Great design, Christine! I'm a bit confused. There are both a "shoulder strap" length and a "handle" length listed. I don't see a shoulder strap. Is there one? Sorry for any confusion, Rebecca. There is not a seperate shoulder strap and we've removed this from the details. I'm a long-time inventor of children's products....I must say, your product is GENIUS! I love the fact that it will also hold a laptop! Great job, Christine! Designed by Christine DeGennaro and made of vegan faux-leather, Sydney Love reversible tote bags boast a unique combination of European styling and American practicality. Rich colors and exposed stitching "inside and out" are a nod to Christine's appreciation for Italian design, while reinforced straps add durability and comfort for carrying everything from your laptop and wallet to workout gear and other essentials.